Maud Powell was born at Peru, Ill., 1868, but shortly after her family moved to Aurora. After studying with William Lewis, of Chicago, she was taken to Leipsic, where she studied under Schradieck. After graduating at Leipsic she went to study in Paris, where she obtained a place in Charles Dancla’s class. In 1883 she made her English début. While in London she met Joachim, who invited her to Berlin, where she became his pupil. She made her début in Berlin at one of the Philharmonic concerts in 1885, rendering Bruch’s G minor Concerto. In the same year she proceeded to New York, and after a brilliantly successful appearance with the Thomas Orchestra, she toured the States, winning golden opinions. 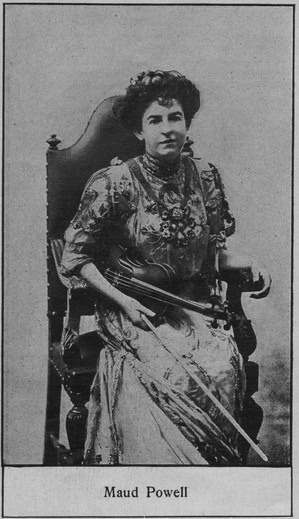 In 1892 she toured Germany and Austria as the representative American violinist with the New York Arion Society, under the baton of Mr. Van der Stucken. She also appeared in this capacity at the World’s Fair in Chicago. In 1894 she organized the Maud Powell String Quartet, with which she toured through the United States. From that time on she has been busy touring the United States and. Europe, everywhere earning the highest praise. Maud Powell is a born artist and her playing exhibits a firmness, breadth of style and finish of technic that easily place her among the foremost ranks of living violinists. She is undoubtedly the foremost living woman violinist. Mme. Homer was born in Pittsburg, Pa., where her father was a minister. She first studied in Philadelphia, and later in Boston, where she married Mr. Sidney Homer, whose songs have achieved considerable success. Shortly after her marriage she went to Europe to complete her studies, and after two years in Paris made her debut before a select audience of musicians and critics. As a result of this she was offered an engagement at Covent Garden, London, for the following season, where she made her debut as Amneris in Verdi’s “Aida.” In September of the same year she sang at the Royal Opera “de la Monnaie,” Brussels. The result of her London success was an engagement to sing at the Metropolitan Opera in New York, where she has now sung for seven successive seasons. She affords a noticeable example of the fact that motherhood need be no bar to success. She and her husband are an exceptionally devoted couple, and the famous twins are healthy evidence of the happiness which has fallen to the great singer’s lot. Her repertoire includes many of the Wagner operas, in which she sings with remarkable dramatic force. She has also sung in oratorio, in which she has shown that it is possible for a singer to be successful alike in opera and in the concert room. She has a voice of great power, and her notes ring true in the upper register and have great fullness and richness in the lower tones. Lillian Blauvelt was born at New York, March 16, 1873. She is an American with a long line of American ancestors, of Dutch origin. Her mother was Welsh. She began her career as a violinist at the age of eight, making her début at Steinway Hall, New York. At the age of fifteen she commenced studying singing at the New York Conservatory of Music under Jacques Bouhy. She studied further with him in Paris, on his return to that city, and gained some experience at miscellaneous Continental concerts. Her operatic début took place in Brussels, September 12th, 1891. Owing to ill-health she was obliged to cancel her operatic engagements and return to America. She subsequently concertized throughout the States and Canada, under various prominent conductors, and she went on tour with the Damrosch Orchestra in 1893. In 1898 she went to Italy to study the language, and subsequently appeared in Verdi’s “Requiem” at Rome, taking the place of the soprano soloist, who was suddenly taken ill. Mme. Blauvelt acquitted herself excellently. She was commanded to sing before Queen Margherita at the Quirinal during the visit. 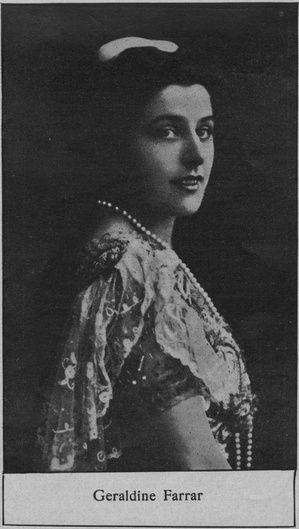 Her next appearance was in Munich, the same year, after which she appeared in London at the Queen’s Hall. She appeared in opera at Covent Garden for the first time in 1903, and acquitted herself with great success. 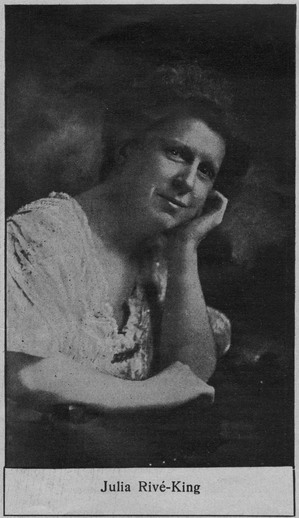 Julia Rive was born on October 31, 1857, at Cincinnati, Ohio. Her mother was a well-known teacher, and was responsible for the early education of her daughter, who appeared in public for the first time in her eighth year. Soon after she became a pupil of Dr. William Mason and other eminent teachers in New York. At the age of fifteen she was taken to Europe to complete her training, and studied under Reinecke at Leipsic. She also studied in Dresden, under Blassmann and Rischpister Under the direction of Reinecke she made her début at the age of seventeen and created a furore at her initial performance. A contemplated European tour had to be abandoned on account of the death of her father, and she returned to America. In 1873 she appeared in public at Cincinnati, and shortly afterwards at a Philharmonic concert in New York (1875). Her reputation rapidly increased, and she became, as she still is, one of the foremost woman pianists in America. Her career has been a long succession of triumphs from the Atlantic to the Pacific. In 1876 she married Mr. King in Milwaukee, and from that time on she has used the name of Rive-King. Her repertoire is said to be very great, rivaling that of Rubinstein and von Bülow. She has also established a reputation as a composer of charming piano pieces, of which “On Blooming Meadows” is a great favorite. Geraldine Farrar was born at Melrose, Mass., 1880. She is the daughter of Sidney Farrar, a well-known base-ball player. Her teachers were Emma Thursby and Lilli Lehmann. She made her operatic début at the Royal Opera, Berlin, during her nineteenth year, playing Marguerite in Gounod’s “Faust.” In 1906 she made her début at the Metropolitan Opera House in New York, which she undertook the rôle of Juliette in Gounod’s “Romeo et Juliette.” She made a great success and has, since that time, been a favorite with American opera-goers. Her most famous rôle is that of “Madame Butterfly,” and her portrayal of the unhappy heroine in Puccini’s masterpiece has never failed to make a great impression upon her audiences. She has also made occasional appearances on the concert stage, but owing to the fact of her being under contract to appear both at the Metropolitan in New York and at the Royal Opera in Berlin she has naturally little time for recital work. Few more gratifying instances of the success American girls are achieving at the present time occur to one. 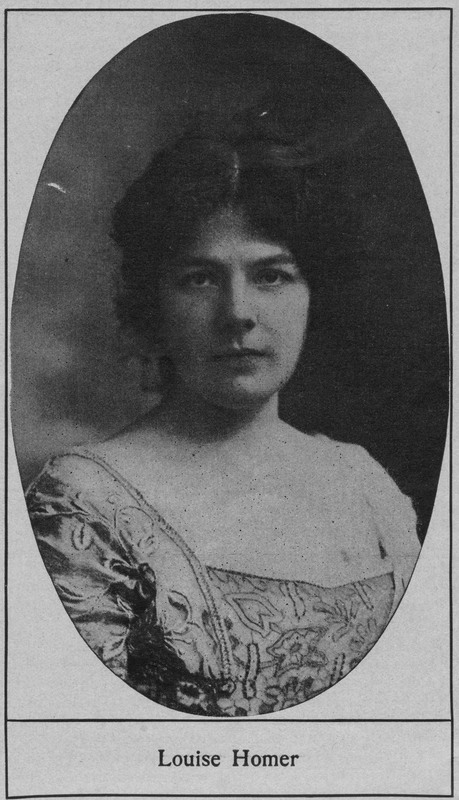 Miss Farrar possesses a beautiful voice, and has high histrionic abilities, and she has well merited the success which has come to her so early in life. It will be interesting to note Miss Farrar’s future development in her art. Mme. Nordica (nee Norton) was born May 12, 1859, at Farmington, Me. She studied singing under John O’Niel, New England Conservatory, Boston. After singing in church work, she went on an extended concert tour throughout the country. In 1878 she went to London with Gilmour’s Band. She then went to Milan, where she studied under Sangiovanni, and in 1879 made her début in opera, under the name of Nordica, at Brescia, as Violetta in “Traviata.” She then proceeded to Germany, where she sang in various cities. In 1881 she was engaged to sing in opera at St. Petersburg. In 1882 she married Mr. Frederic A. Gower, and for a time retired from public life. A short time afterwards her husband was killed in a balloon accident, and she resumed her musical career at Boston in 1885. She next went on tour with Mapleson throughout America and the English provinces. In 1887 she made her début at Covent Garden in the part of Violetta, and at once achieved a great success. 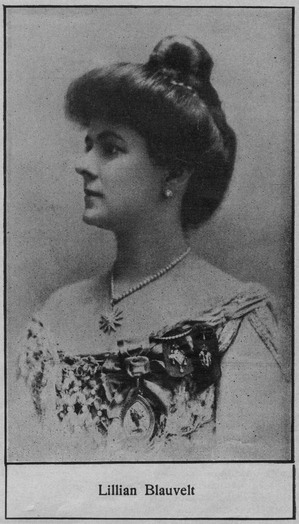 Until 1893 she sang every season at Covent Garden, which was then under the management of Sir Augustus Harris. In 1894 she sang in “Lohengrin” at Bayreuth. 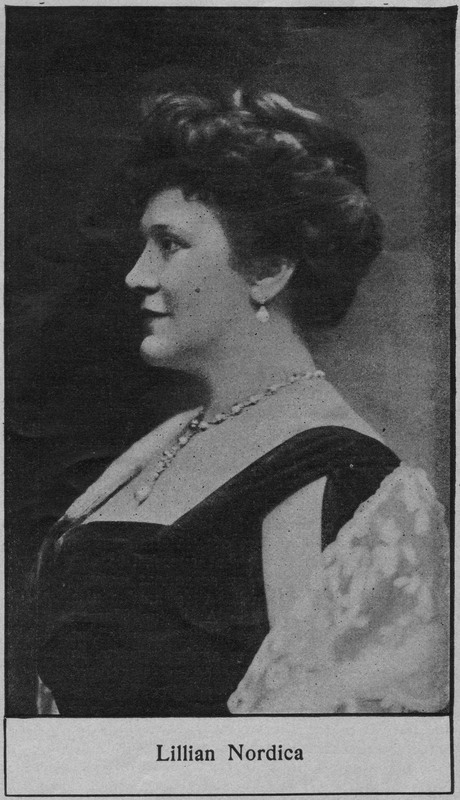 Later she again appeared in London, singing in concerts and at Covent Garden, adding to her Wagnerian repertoire. Mme. Nordica is one of the few singers who excel alike in both dramatic and florid singing. You are reading The Etude Gallery of Musical Celebrities from the July, 1909 issue of The Etude Magazine. The American Woman Pianist of To-day and Yesterday is the next entry in The Etude.